Dear Visitor, I would like to offer you a brief outline of the main characteristics that make my instruments unique and clearly and unmistakeably distinguish them from others. All my instruments are made following my own personal models, created from in-depth studies of the most important classic (Amati, Stradivari, Guarneri) and modern (Ornati, Garimberti, Fagnola, Poggi, Antoniazzi) makers, and this has allowed me to reach an unmatchable level in acoustic, artistic and aesthetic terms. Thanks to a special and complex construction method, which assures total control over the acoustic characteristics, I am able to give each of my instruments the type of sound required by each musician when placing his order. I have developed and perfected this construction method over many years of study and research, and finally and with absolute certainty I am able to obtain the acoustic result required by each musician for each instrument, and during construction am therefore able to customise the sound of the instrument according to the specific needs of the musician himself. I am the only person in the world using this method, which also allows me to obtain generally unique acoustic characteristics, of absolute excellence, which cannot be found joined together in the instruments created by other makers: great power and sound volume, warm and deep timbre, clear and clean sound with an immediate response. All this thanks also to the fitting up and sound adjusting, both done using my very own totally innovative technique. Each of my instruments is therefore extremely versatile, being ideal for both soloists and orchestra players, for both chamber and modern music. And finally, do not forget the highest quality paintwork, obtained using my own personal formula and applied using a special technique that ensures a warm, uniform colour and excellent transparency. Please visit the "Create your ideal instrument" page, where you can create, see and hear your own ideal instrument by selecting all your preferred characteristics. In addition to my own personal instruments, I am also able to supply instruments made by my assistants and students, who work following my precise instructions and with my own personal supervision during all construction phases. These instruments are displayed in the: "Workshop Instruments" page. Finally, I would like to inform you of the possibility also of supplying instruments made by the most important modern and antique makers, carefully selected and prepared to ensure the best possible acoustic performance. See these instruments in the “Antique instruments” page. When you buy a Piccinotti, you are not just buying a musical instrument, but much more, you are coming into possession of a rare and exclusive work of art, with only a few made in the whole world, and each one totally unique. Only a very few lucky and shrewd musicians are able to say, “I own a Picci­notti. There are only a few dozen in the whole world.” A Piccinotti is forever. 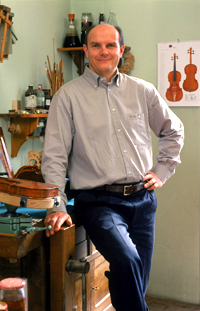 Founder member and current chairman of the "Liuteria Parmense"
Founder member of "Liutai Milanesi Contemporanei"
1997/1998 – restoration andof stringed instruments at the “Scuola di artigianato Artisti­co del Centopievese"
1998/2011 - stringed instrument painting at the "Civica Scuola di Liuteria" in Milan.